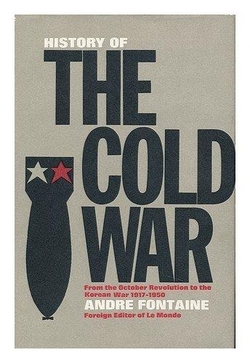 Written 'by the foreign ed­itor of the leading French newspaper, Le Monde, this book traces the early history of the Cold War. The term Co1d War was invented in 1947 by Bernard Baruch to describe Soviet-American relations of the post-World War period. M. Fontaine, however, believes that its origins go back to the incep­tion of Communism in Rus­sia, for by this term he means not only the recent precarious relationship be­tween: East and West, but the whole "confrontation of Soviet power and the bour­geois world." Accordingly, the account begins with the Russian Revolution. Having estab­lished themselves in Russia, the Bolsheviks' primary con­cern was to spread their power to the rest of the world; but, just as "the West failed to overthrow the Communist regime, so the Communists failed to export the revolution." For this rea­son, they decided to withdraw from international affairs and concentrate on building up internally. Dur­ing the decade 1921-1931 the Cold War was, as it were, in suspension. With the rise of the Nazis in Germany, the Soviet Union, now ruled by Stalin, was forced to reenter inter­national politics. Stalin's unique preoccupation throughout was with his personal power. To further this end, he entered in 1939 into negotiations with Eng­land and France, as well as with Germany, with the in­tention of remaining outside the fighting and watching his enemies destroy each other. This plan succeeded until 1941, when Germany invaded the Soviet Union and Stalin had to ally himself first with Britain and then the United States. The complex relationship that evolved between these un­easy allies from 1941 to 1950 constitutes the core of M. Fontaine's book. marked the apogee of Soviet-Western collabora­tion. Beyond ideological dif­ferences, ulterior motives, and suspicion, bonds of solidarity had at last been forged, tem­pered by the blood of the best of men, but their soli­darity created an illusion ... Long before the atomic bomb came into the picture, they [Stalin, Roosevelt, and Churchill] had recognized that in the world to come the basic responsibilities for peace and war would be in the hands of a very small group of powers. They felt that the fate of humanity depended on their under­standing or misunderstand­ing. Stalin pointed out that the difficult task would come after the war, when the di­versity of their interests would tend to divide the Allies. 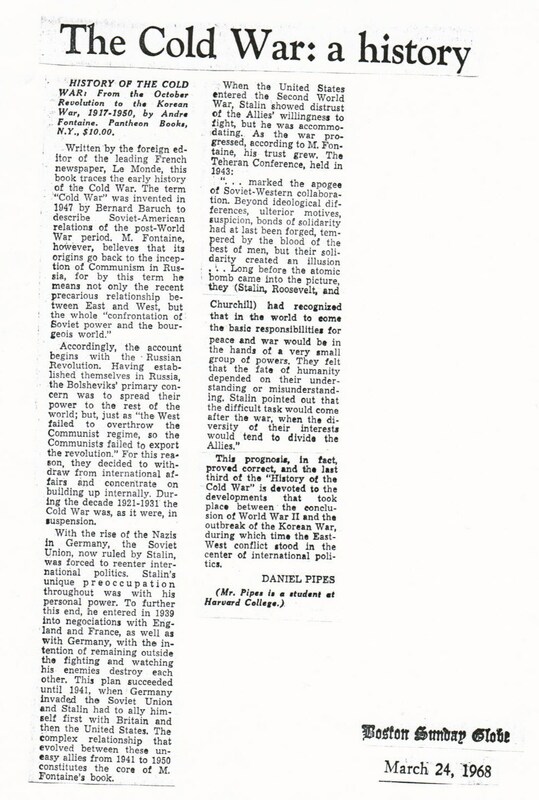 This prognosis, in fact, proved correct, and the last third of the History of the Cold War is devoted to the developments that took place between the conclu­sion of World War II and the outbreak of the Korean War, during which time the East-West conflict stood in the center of international poli­tics. Mr. Pipes is a student at Harvard College.